It is very useful to know what is what, and where it is! 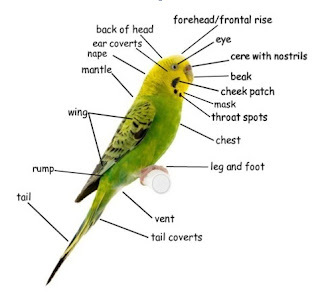 You should make yourself familiar with the anatomy of your feathered friends. In particular when it comes to the health of budgies, it is important to have some basic knowledge of the bird's anatomy. Being prepared with this knowledge, in a case of emergency you can call your vet and for example exactly describe at which part of its body your bird is injured. Beak - this made up of two parts, the upper and lower mandible. The upper mandible is the top part that you can see most of the time. Your budgie is able to move this part, whereas the lower mandible is the bottom part of the beak, which is unable to be moved. The beak is made of keratin over bone. The keratin has blood vessels and there for is alive and has feeling. Cere – this is an area of tough skin above the beak that surrounds the nostrils. In adults it is usually smooth and blue on males and rough and brown on females, however this differ in a couple of varieties. Cheek patch – this is the triangle shaped patch of violet, grey or silver feathers below the eye on the cheek. Ear coverts – the feathers that cover the budgies ear. Eye – budgies eyes have a pupil (central dark circle) and an iris (the white ring around the pupil. In some varieties the pupil appears plum coloured or red, and the iris can be black making the budgie appear to have no iris ring but solid black eyes. Feet – budgies have four toes arranged with two pointing forward and two backwards. This is a feature common to all parrots. Mantle – the area of feathers in a triangle between the top of the budgies wings. Mask – this refers to the area of the budgies face, below the beak. Specifically the area that is yellow or white that stops just below the spots. Rump – the rump is the area above the tail on the budgies back, you will find a gland here called the uropygial or preening gland. The budgie will rub it with its head and beak to collect oil from the gland, and then transfer it to its feathers which provides waterproofing. Tail coverts – shorter feathers at the base of the tail, as seen in the diagram of feathers. Throat spots – these are the round black spots arranged along the base of the mask. In wild type and small pet budgies there are often six small spots. In larger show type budgies these have often increased in number and size and have an elongated shape. Also in some varieties they may be altered. Vent – this is basically the budgies bottom, also called the cloaca. They have a single hole that expels all waste, and is also used in mating and egg laying.